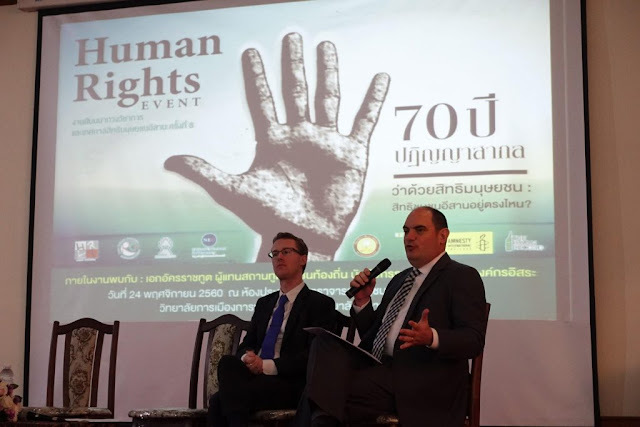 In late November, the US, Canadian and British embassies along with several other European partners as well as the US National Endowment for Democracy (NED) and Amnesty International, organised what they called the "Isaan Human Rights Festival" in northeast Thailand. 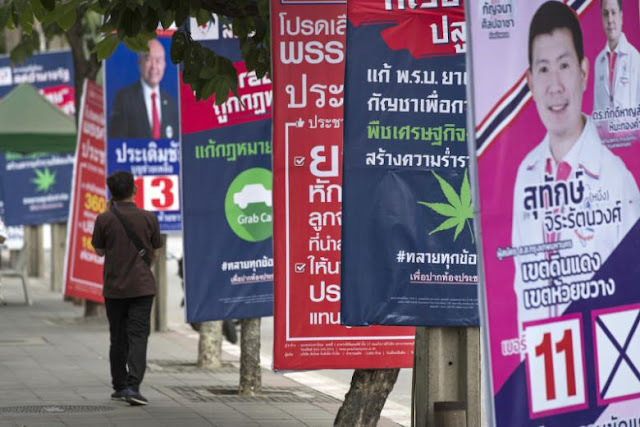 Foreign embassies have funded and directed a number of events to breath new life into the political proxies of ousted former prime minister, Thaksin Shianwatra in pursuit of regime change in Thailand. The 8th Annual Isaan Human Rights Festival brought together 17 communities from across the region, activists, scholars, and international and Thai students. Ambassadors from Finland, Sweden, and the United Kingdom were in attendance, as well as political officers from Canada, the European Union and the United States. National Human Rights Commissioner Angkhana Neelapaijit also attend the event. Hosted by Mahasarakham University’s College of Politics and Governance, the festival opened a rare space to discuss the human rights situation in the Northeast. While the US-funded media outfit mentioned funding provided by the Germany-based Heinrich Böll Foundation, it failed to mention other sponsors whose logos were clearly visible in media used throughout the event. The foreign-sponsored "festival" takes place against the backdrop of a currently dormant Thai political crisis. In 2014, the Thai military ousted then Prime Minister Yingluck Shinawatra, sister and publicly admitted proxy of Thaksin Shinawatra, a convicted criminal hiding abroad to evade a jail sentence and who was himself ousted in 2006 in a similar coup. Since Thaksin Shinawatra's ouster in 2006, he has led a campaign of terrorism, street violence, armed insurrection and assassinations. This includes riots in 2009 that saw sections of Bangkok lit ablaze and at least two shopkeepers gunned down by looting Shinawatra supporters. The following year, Shinawatra organised up to 300 heavily armed militants who fought for weeks in the streets of Bangkok against the military, leaving nearly 100 dead and culminating in citywide arson. Shinawatra supporters have been banned from gathering in Thailand for good reason. They are used by Shinawatra's political proxies to incite unrest, violence and substantial bloodshed in pursuit of regime change. The most recent coup was precipitated when Shinawatra's militants began murdering anti-Shinawatra protesters in the street. 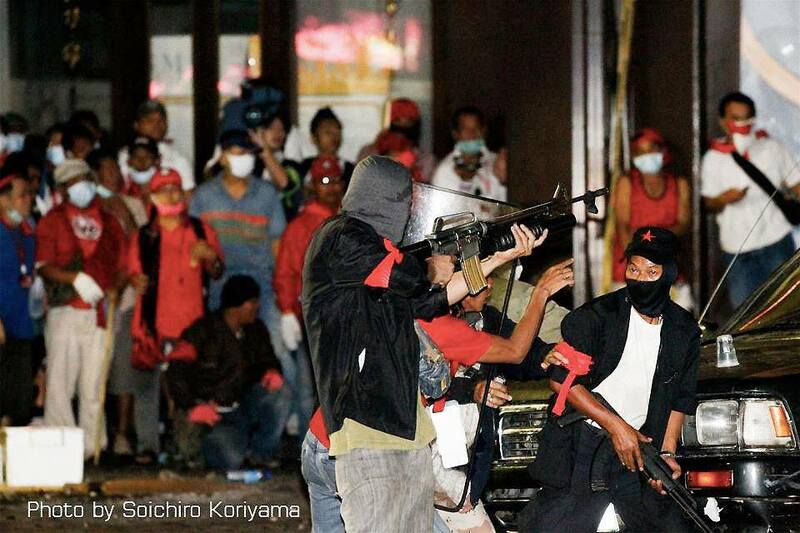 Armed with assault rifles and grenade launchers, hit-and-run attacks targeted protest camps across Bangkok and even those that sprung up in other provinces. Over 20 would die, including women and children. Such violence is backed by complicit foreign governments, the Anglo-American and European media, and an army of foreign-funded fronts posing as nongovernmental organisations (NGOs) who help cover up, spin and excuse the violence and the military's reaction to it, portraying Thailand's armed forces as heavy-handed and oppressive. 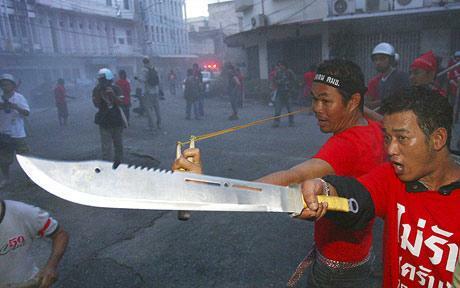 Shinawatra supporters engaged in armed violence in 2010. Nearly 100 would perish in gun battles over several weeks, ending in citywide arson. The November 2017 festival itself had many of the NGOs lobbying for Shinawatra and his supporters in attendance and was eagerly promoted across social media by those unable to attend. The festival kicked off with a panel on human rights in the Northeast. Representatives of five regional non-governmental organizations voiced their concerns about the shrinking space for popular representation and the military regime’s repression of community voices. After taking power in a coup in May 2014, the military junta had banned gatherings of more than five people. Violation of the ban a maximum penalty of six months in prison or a fine of 10,000 baht (about $300 US). Several northeastern activists have been prosecuted for exercising their right to freedom of assembly and freedom of speech between May 2014 and September 2015, according to a report from Thai Lawyers For Human Rights. Thai Lawyers for Human Rights (TLHR) is another US State Department-funded front, created with direct assistance from the US Embassy in Bangkok the day after the 2014 coup. Foreign diplomats quite literally hold the hands of political agitators they fund in Thailand. 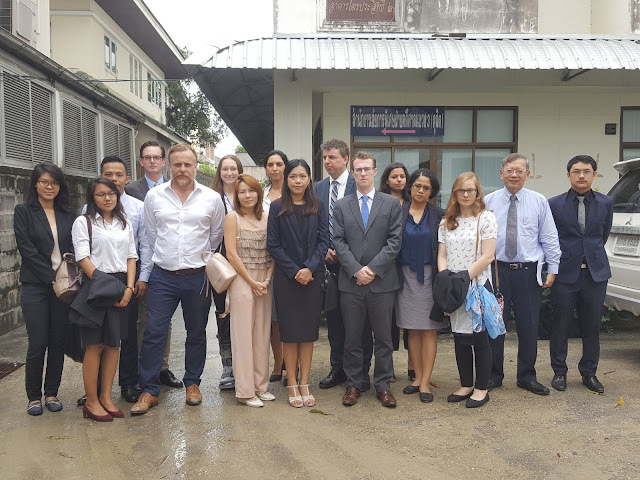 Pictured centre is Sirikan Choroensiri of the US State Department created and funded front, Thai Lawyers for Human Rights, flanked by European and Canadian diplomats and staff. The "activists" arrested were likewise from foreign-backed fronts opposing the coup, many of whom enjoy direct ties to diplomats from the US, British and EU missions. And while the "Isaan Record" claims gatherings of more than five people have been banned, this is not entirely true. Gatherings that have been banned are those sponsored by foreign interests on behalf of the ousted government of Thaksin Shinawatra and his proxies. Other events and gatherings, including those petitioning the government on a wide variety of practical issues have gone forward, including gatherings by groups that have opposed government decisions, but who constructively proposed solutions to specific problems and were willing to work with the government to achieve them. In other words, the "space" the US embassy and its European partners seek to create in Thailand's political landscape is for supporters of the ousted government merely under the guise of addressing "human rights." Even at first glance, the notion of foreign embassies "opening space" to discuss the internal politics of a foreign nation is a blatant violation of that nation's sovereignty. That the event was held in Thailand's northeast region, known as "Isaan," the former political stronghold of Shinawatra, is no coincidence. The "festival" was organized to breath life into what has been an otherwise dormant opposition since Shinawatra and his sister were both removed from power. Without a constant torrent of monetary and material support, this "opposition" would atrophy and perish. By providing this "space" with Shinawatra's supporters condemning the Thai government from behind a line of foreign ambassadors, the lifespan of Shinawatra's opposition is artificially extended until some time in the future when it can be once again funded, rearmed and unleashed in the cities and villages of Thailand to sow another decade of political crisis, destabilisation and bloodshed. One could imagine the reaction from Washington should the Russian ambassador and a front of Russian-friendly nations organise a similar event in America's Midwest and how quickly it would be condemned as foreign interference, all in attendance arrested and tried for sedition and diplomatic ties with Russia severed entirely. The unfortunate reality for Thailand and nations like it is the prevailing geopolitical maxim of "might makes right." Thailand lacks the ability to move against overt foreign-funded subversion conducted directly on its own soil by still powerful and influential nations like the US and the UK. Barring the event, arresting its attendees, expelling diplomats or cutting ties with those nations sponsoring such activities are not realistic options for Thailand. Instead, patience and asymmetrical responses are required, including the reformation of Thailand's media which is currently overrun by foreign-trained Thai journalists, many of whom serve merely as scribes for US and European talking points. Filling Thailand's political space with genuine Thai NGOs, thus displacing foreign-funded fronts posing as NGOs, and addressing legitimate concerns regarding everything from the environment to human rights concerns, working with the government on these issues rather than exploiting them to subvert political stability, is also a viable and constructive option. What is perhaps most ironic of all about those involved in this brand of foreign interference in another nation's internal affairs is that their personal social media accounts are awash with headlines about "Russian interference" in American and European politics. It is ironic because what the US accuses Russia of without evidence, is something each and every one of these diplomats and NGO workers are demonstrably guilty of on a daily basis. US and European pressure on Thailand stems from an ongoing long-term effort to encircle and contain China with a united front of nations along its geopolitical peripheries. By replacing Thailand's sovereign government with a reliable client state or a divided, failed state, would deprive Beijing of an economic and political partner in the region. The current government of Thailand has forged strong ties with China, including through the acquisition of weapons to replace its ageing US-made arsenal and mega-infrastructure projects including a high-speed rail network.